Medieval German Paintings on the Lower Rhine. For a general guide to the evolution of painting and sculpture in Germany and elsewhere, see: History of Art (800 BCE -present). The term "Cologne School of Painting" loosely describes those Old Masters who were active in the medieval city of Cologne, and the lower-Rhine region, from about 1350 to 1550. Its representative religious paintings - mostly altarpieces - illustrate the various styles of oil painting practiced in Northern Europe during the period. The most important (and only firmly identified) member of the Cologne School was Stefan Lochner (c.1410-51). 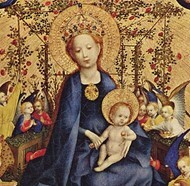 The most significant influences on the development of the Cologne School were, chronologically speaking: (1) 14th-Century French painting, principally small scale works like illuminated manuscripts; (2) Late Gothic art, of the type being practised by the Sienese School of painting, following the Byzantine traditions of Constantinople; (3) International Gothic art, notably works like the Dijon Altarpiece by Melchior Broederlam (1350-1411); and (4) Flemish painting, as exemplified by the naturalist paintings of Roger van der Weyden (1400-64) and Dieric Bouts (c.1410/20-75). NOTE: During the 14th and 15th centuries, Cologne was one of the most important, wealthy and secure cities in Europe, with some 42,000 inhabitants, and a thriving economy based on its membership of the Hanseatic League. Its wealth, along with its extensive network of churches, chapels, monasteries and charitable foundations - and of course the magnificent Cologne Cathedral - provided a fertile environment for Christian art of all types. Not for nothing was it known as the "Rome of the North". For developments in southern Germany, see the Danube School (1490-1540) led by Albrecht Altdorfer (1480-1538). The most important member of the Cologne School was Stefan Lochner (c.1410-51). Lochner (not properly identified until the 19th century) is famous for the greatest masterpiece of the Cologne School - a triptych known as The Dombild Altarpiece (Three Kings Altarpiece, also called the Altar of the City Patrons) (c.1440, Cologne Cathedral) - as well as numerous works including: Madonna of the Rose Bower (c.144042, Wallraf-Richartz Museum, Cologne); the Last Judgement Triptych (1435-40, Wallraf-Richartz Museum, Cologne); Crucifixion with Saints (1445, Alte Pinakothek, Munich); Presentation of Christ in the Temple (1447, Hessisches Landesmuseum Darmstadt); and Saint John the Evangelist (1448-50, Museum Boijmans Van Beuningen, Rotterdam). Other members include the late Gothic Master of the Life of the Virgin (active 1463-90) - possibly Johann van Duyren - whose masterwork is The Life of the Virgin Altarpiece (c.1465-75), a polyptych painted for the Church of St Ursula in Cologne, comprising eight scenes from the Life of the Virgin Mary, divided between the Alte Pinakothek in Munich and the National Gallery in London. Another work attributed to him is The Deposition (1465, Wallraf-Richartz-Museum). A later and even more important member was the Master of the Saint Bartholomew Altarpiece (active c.1480-1510), a Netherlandish artist who is credited with the St.B Altarpiece (1503, Alte Pinakothek, Munich) and also The Deposition (1500, Louvre, Paris). Other members of the Cologne School include William of Cologne (active 1370-90), Bartholomaus Bruyn (1493-1555), the Master of St Veronica, the Master of the Darmstadt Tree of Jesse, the Master of the Sinzig Mount Calvary, and the Master of the Lyversberger Passion. In addition, Conrad von Soest (c.1370-1422) - the leading Westphalian artist of his day - is also believed to have been associated with the Cologne School, although details are lacking. Conrad von Soest was noted for works like the Niederwildungen Altarpiece (c.1403, Stadtkirche, Bad Wildungen), the Marienaltar (Life of the Virgin Triptych) (1420, St Mary's Church, Dortmund) and the St. Dorothea Diptych (c.1420, Westphalian State Museum). NOTE: Other important artists active in Germany during the 15th and 16th centuries, include: Albrecht Durer of Nuremberg (1471-1528), the Mainz religious painter Matthias Grunewald (c.1470-1528), Martin Schongauer (after 1455-91) noted for his Madonna in the Rose Garden (1473); the romantic Hans Baldung Grien (1484-1545); and the portraitist Lucas Cranach the Elder. Major German wood-carvers, include: Michael Pacher (1430-98), Hans Multscher (1400-67), Veit Stoss (c.1447-1533), Tilman Riemenschneider (c.1460-1531), and Gregor Erhart (c.1460-1540). To begin with, around the middle of the 14th century under the influence of Gothic illuminated manuscripts made in France (from 1300 onwards), the Cologne School produced mostly small-scale altarpieces such as the Klaren Altar (altar of the Clares) (Cologne Cathedral). From around 1400, influenced by trends in Burgundy, the School switched to larger panel paintings designed for church altars, including a number of multi-panelled works, such as the polyptych known as The Life of the Virgin Altarpiece (c.1465-75). The aesthetic highpoint of the Cologne School is considered to be about 1450, shortly before the death (from plague) of Stefan Lochner. Until the late 15th century, the Cologne School remained largely uninfluenced by the painterly advances in linear perspective and modelling being achieved by the Florentine Renaissance in Italy. Instead it remained closer to the traditions of Byzantine art until the 1480s, when it came under the influence of the Netherlandish Renaissance and the naturalism of the great Flemish painters. Lochner, for instance, was less concerned with delineating perspective, preferring to set his pictures in shallow space and allow his backgrounds to 'dissolve into solid gold'. Only in later life did he develop a more realistic style. The Cologne School underwent a revival during the last two decades of the 15th century, thanks to the influence of Roger van der Weyden and the work of the Master of the Saint Bartholomew Altarpiece. For example, the latter's Deposition of Christ (1500, Louvre, Paris) borrows noticeably from van der Weyden's Descent from the Cross (1435-40, now in the Prado Museum), not least in its naturalism and emotional intensity. In addition, there was an increase in history painting, as well as portraits of individuals. The latter was caused by the arrival in Cologne in 1512 of Bartholomaus Bruyn (14931555) - noted for the Essen Altarpiece (1522-5) but most especially for his portrait art. Works by Bruyn like Portrait of a Knight (1531, Kunsthistorisches Museum, Vienna), Portrait of Elisabeth Bellinghausen (1538-9, Mauritshuis), Anne of Cleves (1539, Trinity College, University of Cambridge), and Portrait of a Young Man with Gloves (1550, Kunsthistorisches Museum, Vienna) helped to usher in the German Renaissance and, in the process, signalled the end of the Cologne School. Carolingian, Ottonian Architecture, Book-Painting: Salian/Hohenstaufen Culture. Cathedral Statues, Religious Reliefs, Wood-Carvings. Characteristics of Architecture, Sculpture in Germany. Works reflecting the style of this art movement can be seen in some of the best art museums in the world, notably the Wallraf-Richartz Museum, Cologne and the Kunsthistorisches Museum, Vienna.  For more about religious painting along the Rhine during the Middle Ages, see: Homepage.